This is not the first time Michelle Obama has given her husband this glare at a key moment. After Barack Obama laughs with First Lady Melania, he is greeted with the death stare. 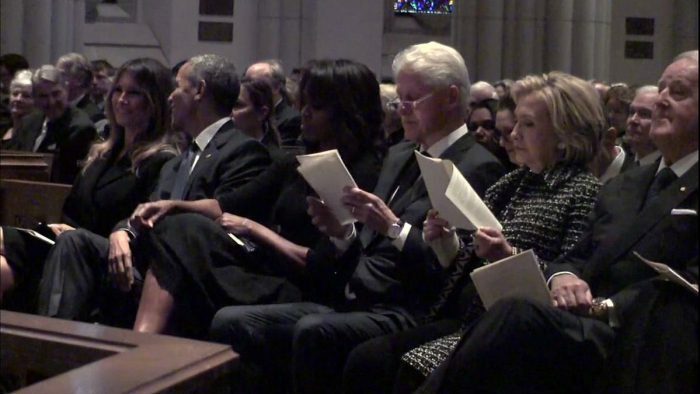 Melania made the trip to Barbara Bush’s funeral without her husband. She sat next to Barack Obama. In the photo below the two can be seen sharing a laugh. They were also accompanied in the pew with Bill and Hillary Clinton. Things got a little heated when Michelle caught her husband and Melania sharing a laugh. Obama: Melania smells like heaven..
Michelle: What the f*ck you grinning about..
A little bit of an awkward exchange but overall it was a great event. Good to see all of the different people come together to pay tribute to Barbara Bush. Interesting note: Melania has 5 people she follows on twitter. President Obama is one of the 5.